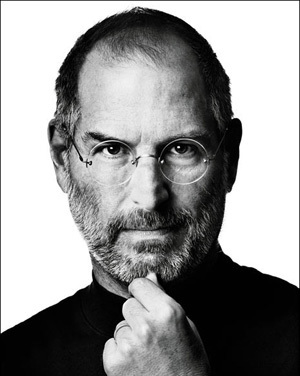 As many of you already know, Steve Jobs has passed away. We’d like to say thank you to Steve for pushing humanity forward. We’ll forever be different thinkers, forever be foolish, and forever be hungry. Tech Tribe News has also taken a leave of absence from the website effective immediately. We hope that in the future we can relaunch our website. While some of us could care less about the latest gadget, or even how we treat the ones we own, there are those out there that love their gadgets like they love people. They clean them, buff them regularly, and treat them like family. So it’s inevitable that cases for any gadget should be available launch day in fear of dropping your new machine you just threw down cash for. And most of us are picky. Recently, I had the chance to try a new experience in case design, called Coveroo (coveroo.com). They specialize in partnering with case-makers (like iLuv, Incase and many more) to give you a customized case different than those mass-produced. You’re guided through a couldn’t-be-any-simpler process of picking an image, a device (iPhone, Blackberry, iPod, iPad, Kindle, Palm, Samsung, and just about every gadget maker out there), and a type of case for that device. The image selection available at the website is odd is some areas, and great in others (mainly sports). It consists of a select few genres, some among the bunch are (a few) TV shows, (a few) music groups, and other oddities that are more mainstream than some would like. However, if they don’t offer anything to your liking, Coveroo can receive your picture of choice by email. After you’ve selected your image (that goes on the back of the case, and only covers the middle back), you choose your device and type of case . This again couldn’t be simpler. Prices start at $35 not including shipping and you can add a personal message (much like an iPod engraving) on the lower-middle-back of the case for only $5 that’s 15 characters long. They even give you a handful of different fonts. There were only two problems I experienced during the process. The first was that the image that you selected on the website may look great, but on the bigger iPad case that I received, it was pixilated with a rough white boarder around the image. When someone pays for the product, they should get a clear crisp image, not some pixilated mess. On a smaller device like an iPod, it probably isn’t an issue, but it’s important you stock large images for large products. Pretty simple. Secondly, along with the case I received an iPad stand. You know the material that they package headphones in? That ugly plastic that you usually need scissors to cut open? That’s what the stand is made of, and it was equally hard to fold into position. It was a nice bonus, but it was way to flimsy for me to risk my iPad in. Pretty much a loss to toss that in with the case. Verdict: As cases go, Coveroo tops the lot of them. Not only can you personalize the case for just about any gadget in production, but they also feature popular cases from the most popular case makers. You can get a really sturdy, quality case personalized to your liking for almost the same price as you would a normal case! There are only a few kinks left in this awesome process. I recommend looking into Coveroo (coveroo.com), but for now, stay away from larger devices and stick to the smaller ones. Smaller devices have a much better case selection and images aren’t as pixilated. **note: iPad case received w/ personal message and shipping, free of any charge. 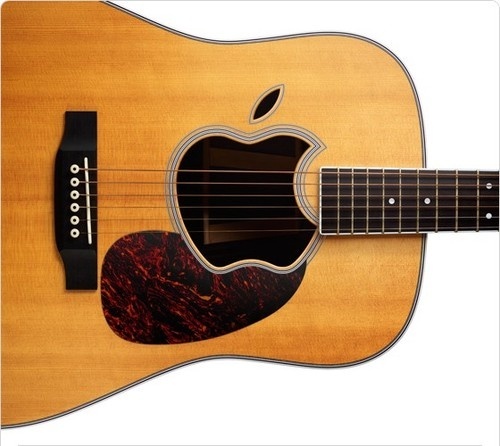 Apple today introduced iTunes 10 with Ping, a new music-oriented social network for following your favorite artists and friends to discover what music they’re talking about, listening to and downloading. iTunes Ping lets you post your thoughts and opinions, your favorite albums and songs, the music you’ve downloaded from iTunes, plus view concert listings and tell your friends which concerts you plan to attend. iTunes 10 also features HD TV show rentals for just 99 cents an episode and AirPlay wireless music playback. 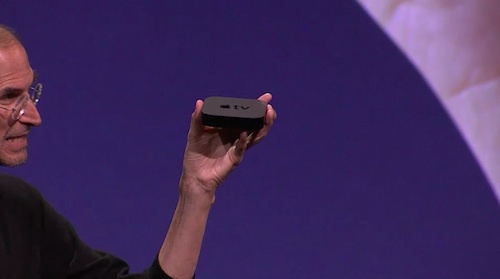 Also announced is the new Apple TV which offers the simplest way to watch your favorite HD movies and TV shows on your HD TV for the breakthrough price of just $99. Apple TV users can choose from the largest online selection of HD movies to rent, including first run movies for just $4.99, and the largest online selection of HD TV show episodes to rent from ABC, ABC Family, Fox, Disney Channel and BBC America for just 99 cents. Apple TV also streams content from Netflix, YouTube, Flickr and MobileMe, as well as music, photos and videos from PCs and Macs to your HD TV. Enjoy gorgeous slideshows of your photos on your HD TV using Apple TV’s selection of built-in slideshows. Apple TV has built-in HDMI, Wi-Fi, Ethernet and an internal power supply for easy set-up, and features silent, cool, very low power operation in an enclosure that’s less than four inches square – 80 percent smaller than the previous generation. 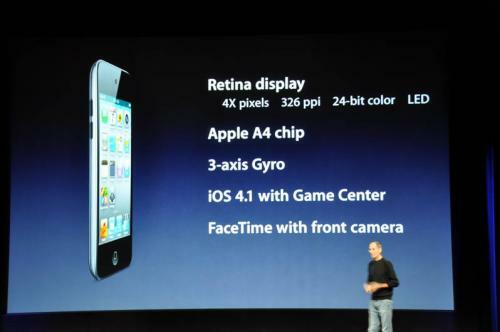 At today’s keynote event, Steve Jobs announced the upcoming availability of iOS 4.1 for the iPhone and iPod touch. Jobs noted that the long running proximity sensor, Bluetooth, and iPhone 3G performance bugs that have been raised by users will be fixed in this update. New features to iOS 4.1 include High Dynamic Range photos, HD video upload over Wi-Fi, TV show rentals, and Apple’s Game Center will make its official debut. Also, Jobs showed off wireless printing in Pages. A “Print Center” app now shows up in multi-tasking tray to manage jobs. The new iPod Shuffle will see the return of buttons and will still include the VoiceOver feature that debuted in the last Shuffle model. It also has playlists capability and will take advantage of the Genius Playlists recently introduced. It will have 15 hours of battery life and will come in 5 colors: silver, pink, gold, blue, and green. The 2 GB Shuffle will cost $49. 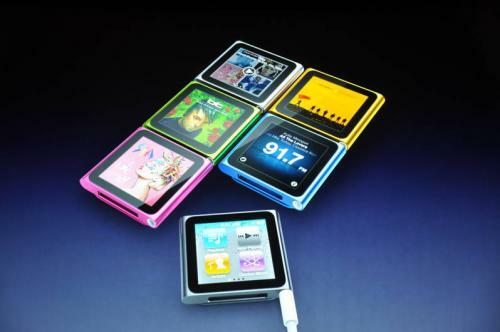 The iPod Nano has also been updated, removing the click wheel and adding a multi-touch interface to reduce the device’s overall size. The new nano is 46% smaller than its predecessor and will have 24-hour battery life. The nano’s new touch interface is similar to that of other iOS devices with a home screen populated with icons to access photos, artists, playlists, control playback, and more. The display’s orientation can be manually rotated to accommodate the device’s position when clipped to clothing. 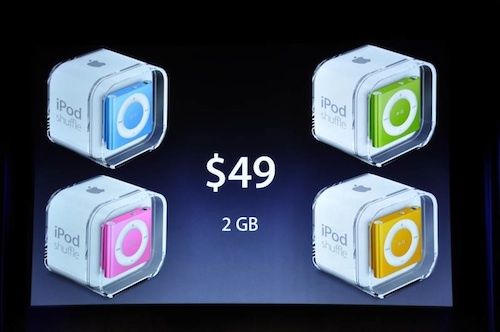 The nano will come in graphite, pink, blue, silver, green, gold, and a Product Red version will also be offered. It will cost $149 for 8 GB and $179 for 16 GB. However, it no longer has a camera or plays video. Lastly, the 5th generation iPod Touch includes the Retina Display (with 324 pixels per inch) that made its debut on the iPhone 4. It will also get Apple’s A4 chip, a 3-axis gyroscope, a rear-facing camera that can record HD video, and a front-facing camera that will work with Facetime. 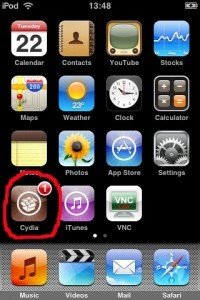 The iPod touch will have iOS 4.1 with Apple’s Game Center and will offer 40 hours of music playback battery life. The iPod touch will cost $229 for the 8 GB model, $299 for 32 GB, and $399 for 64 GB. All new iPod models will be available starting next week and are available for pre-order on Apple’s site today. Yes, like always, Apple has sent out its invitations to select media outlets for a “special event” on September 1st. This time however, it seems the rumors are at an all time high. Expectations of the event include the fourth generation iPod Touch (with Retina Display and dual cameras for FaceTime), cloud support for iTunes, $0.99 TV shows and TV show rentals, a touch screen iPod Shuffle, and a $99 Apple TV (possibly rebranded iTV). Also, could there be a relation between this event and Lady Gaga’s appearance at Cupertino headquarters? Some hope so, most hope not. On a side note: our site has been lacking lately. Recently, we’ve been lucky to receive a lot of new viewers, and while our lives move forward, there simply wasn’t much time for covering news stories. Starting September 1st, we will be back in force! Thanks for sticking with us. Alas, whatever we do see, surely will create waves and will be covered by us. Blackberry Torch: Innovative or Disposable? 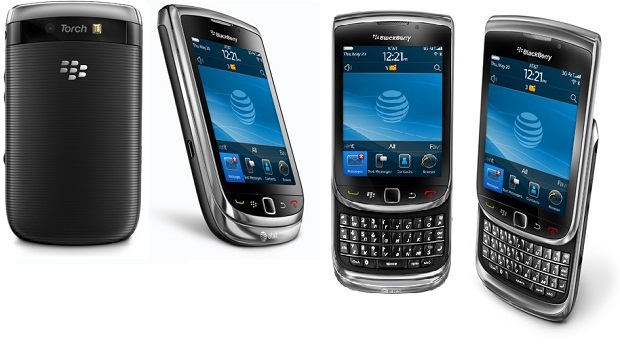 RIM last week unveiled a new handset: the Torch, alongside with BlackBerry “OS 6”. Will the phone keep RIM in the smartphone race? Or will it fizzle out in a few months, much like the Palm Pre? It’s much improved. The Torch brings a sleek hardware design, without sacrificing a keyboard. Also, OS 6 brings tons of new features, like a WebKit based browser, a sleek interface, newer email code, and less bugs. It’s more of the same. It’s the same BlackBerry, and even if it’s OS is greatly fixed, there’s not much new to look at. The hardware makes no major leaps, and we wonder if RIM has lost it’s grip on the market. Verdict: If you use Blackberrys, BUY.